Race wis dropped frae the census efter 1960. A covenant wis signed atween twa commissions frae baith kintras on Julie 26, 1867, but it did nae enter intae force acause it wis nae approved bi the Senate o Haiti. The Dominican Republic (Listeni /dɒmˌɪnɪkən rɪˈpʌblɪk/; Spaingie: República Dominicana, pronoonced [reˈpuβlika ðominiˈkana]) is a naition on the island o Hispaniola, pairt o the Greater Antilles archipelago in the Caribbean region. The wastren third o the island is occupied bi the naition o Haiti, makin Hispaniola ane o twa Caribbean islands that are shared bi twa kintras. 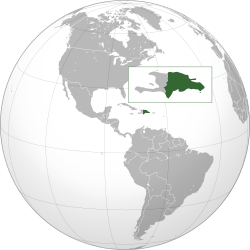 Baith bi aurie an population, the Dominican Republic is the seicont lairgest Caribbean naition (efter Cuba), wi 48,442 square kilometres (18,704 sq mi) an an estimatit 10 million fowk. ↑ 2.0 2.1 2.2 2.3 2.4 "Embassy of the Dominican Republic, in the United States". Archived frae the oreeginal on 2015-06-26. Retrieved February 27, 2009. ↑ Convenios bilaterales entre la República Dominicana y Haití [Bilateral arrangements between the Dominican Republic and Haiti] (PDF) (in Spaingie). Ministerio de Relaciones Exteriores de la República Dominicana. August 2000. pp. 15–17. Archived frae the oreeginal (PDF) on October 22, 2014. Retrieved October 22, 2014. ↑ "12 de julio de 1924, una fecha relegada al olvido". Diario Libre. August 18, 2012. Retrieved September 24, 2014. ↑ 5.0 5.1 5.2 5.3 "CIA – The World Factbook – Dominican Republic". Central Intelligence Agency (CIA). Retrieved June 4, 2007. ↑ "Estimaciones y proyecciones nacionales de población, 1950–2100" (xlsx). Oficina Nacional de Estadística. 1 December 2014. Retrieved 12 July 2017. ↑ 8.0 8.1 8.2 8.3 International Monetary Fund. "Gross domestic product based on purchasing-power-parity (PPP) valuation of country GDP". ↑ "Human Development Report 2016" (PDF). United Nations Development Programme. Retrieved March 21, 2017. Wikimedia Commons haes media relatit tae Dominican Republic. This page wis last eeditit on 15 Februar 2018, at 21:10.